A hand-coloured print of Calcutta, from the Fiebig Collection: Views of Calcutta and Surrounding Districts, taken by Frederick Fiebig in 1851. 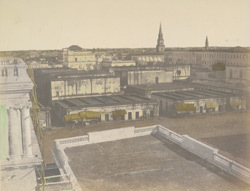 A rooftop view, from the godowns (warehouses) in Fairly Place, looking south-eastwards over Calcutta. Writers' Buildings and St Andrew's Church may be seen on the skyline on the right. Writer's Buildings was once the residence of 'Writers' (clerks) of the East India Company, who recently arrived from England. St Andrew's Church was built in 1818.